I grew up in a home where people took me to church, prayed with me, and talked to me about Jesus. I was brought up a certain way and happened to continue on that path into my adulthood, but not because I never had a choice or because I was forced into it. Even with the many moments of struggling and wrestling with my beliefs, I chose to believe in God. I choose to believe in God. I know I'll hit other spiritual walls in my life that cause me to ask more questions, but I'm forever grateful for the foundation that my parents laid out for me. I hear a lot about letting our kids find their own way when it comes to faith and religion. Let's not tell them what to believe; let's give them a blank slate and let them figure out what they want to believe. 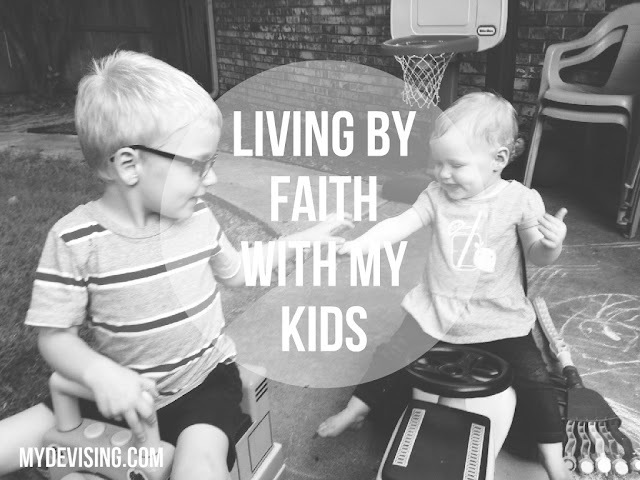 While I always want there to be room for discussion, different opinions, and struggle with faith in my home, I don't necessarily think that means I need to let my kids loose, giving no guidance at all. I will teach my kids thousands of things, so I don't think it's ridiculous to assume that I will also teach my kids about my faith in God - especially since it is the foundation for how I live my life. To keep that - the thing that has saved my life and given me true hope - hidden or subdued all for the sake of letting my children explore aimlessly would be heartbreaking. So when I talk about introducing faith into my kids' lives, it's coming from a place of gentleness, humility, openness, and the desire to share the best part about my life. For right now, we have a 3.5 year old and a 1 year old, so we do have to keep things age appropriate. These are just a few ways we teach our kids about what we believe. A couple of years ago at a MOMS Bible Study, I received a huge stack of bible verses that were organized by age level. These have been so wonderful to use. We have them clipped to our napkin holder on the dining room table. I don't bring them up at every meal time, but I try to talk about them 2-3 times a week. They are simple and easy to memorize. Aside from hearing new words and learning how to memorize, these verses prompt some good 3 year old discussions. Duke is pretty up with the Top 40 hits, but these days, I am listening more and more to Christian music. Not all of the time and not exclusively, but it's definitely more present than before. There are plenty of great artists making music that sends hopeful messages, and I want my children dwelling on those thoughts. Now, I don't think it's necessary to completely shut out the "secular" music world. There's some really good stuff out there. But I want it to be paired with songs that encourage and bring light and life to my kids' minds and hearts. Duke is at the age where learning a song is easy, so it's important to make sure that the songs he's learning are benefiting his soul. I want my children growing up in a home that lives out the verse in 1 Thessalonians that says to pray continually. The depth in which I understand how/why I communicate with God goes hand in hand with the depth of my belief in him. If my children grow up only praying to God when things go wrong or before dinner, they may have a skewed view of who he is. If prayer is something they observe that happens at all times - saying thanks for small things, asking God to heal us when we're sick, praying for our friends, asking God for forgiveness - I think they're more likely to view it as a real conversation with a relational God, rather than something we just do because we're supposed to. We will be a home that prays, that discusses why we believe what we believe, that goes to church, and that reads the Bible. But beneath all of that is the foundation of love. From that, those things will flow. The best that Colt and I can do for our kids is live our lives as free people who are loved by a relational and present God. Yeah, they're so great for these young ages! And the pictures help with memory!